The photo, taken back in August, depicts the newly re-elected 44th President of the US hugging his wife, Michelle. 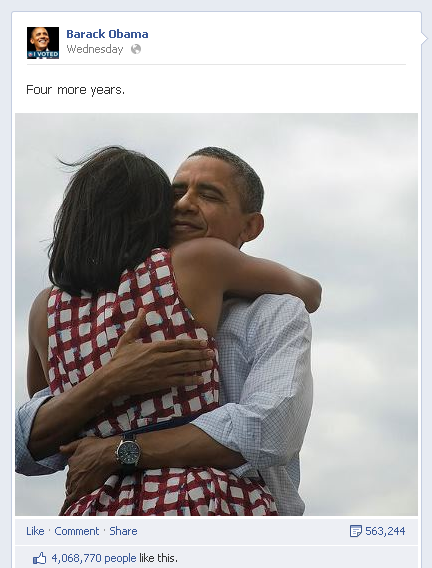 “This Barack Obama photo is the most-liked Facebook photo of all time”, confirmed the social networking site yesterday. Accompanied with the caption “Four more years”, the snapshot has quickly become the new record holder for the most popular image on both Twitter and Facebook. At last count on Wednesday, the image had been retweeted almost 800, 000 times and ‘liked’ over 4 million times on Facebook.